A dream family-focused getaway is only a scenic two-hour drive from New York City through the majestic New York hillside and the Pocono Mountains. North America’s unrivaled #1 family resort rests in the lush, tranquil wooded hillside of Lake Teedyuskung. Teedyuskung may be difficult to pronounce and spell, but it’s home to Woodloch Resort: the family vacation you’ve been daydreaming about ever since your kids were old enough to walk. Start a new family tradition at Woodloch, a 1,800-acre wonderland that accommodates up to 900 guests at one time. What began as a 40-guest lodge sixty-plus years ago has grown into an institution and a year-round lifestyle. The family-run business has been helping families make unforgettable memories—the kind of memories that last a lifetime. You could vacation at Woodloch a dozen times and never try every activity, attend every event, or embark on every adventure. Band together in an escape room, zip line through the Poconos, trap shoot, join a drum circle, witness a magic show, and waterski on Lake Teedyuskung. Woodloch offers year-round limitless excitement and relaxation. Many of these homegrown activities center around team or family-building in the serene natural beauty of eastern Pennsylvania. Woodloch family getaways focus on the concept of “togethering.” The friendly and skilled staff bring loved ones together in hopes of creating lasting memories. The family-run ownership still uses its original credo: “treat all guests as if they were company in their own homes.” This simple mission continues to keep Woodloch guests happy and enthused. A tradition of excellence and endless hospitality endures on Lake Teedyuskung, even as the resort expands and improves. While September signals back to school for some, Woodloch is less than a two-hour drive from New York City, Scranton, Wilkes-Barre, Allentown, and Binghamton, so a quick road trip to Hawley, Pennsylvania should be in order. Spend a September weekend in the serenity of the Poconos Mountains. The fall foliage season is among their busiest because of the color combination of green, orange, yellow, and red. The average high in September is a quintessential 72 degrees—it’s likely the last chance for Northerners to splash in Lake Teedyuskung. 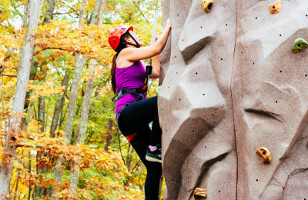 Fall is also peak time for guests to enjoy Woodloch’s contests and adventure activities. Golfing enthusiasts flock to Woodloch Springs’ 18-hole championship golf course in September to bask in the colorful hillside and enjoy the few remaining 70-degree days. The family can always split up for a few hours on a beautiful September afternoon. Dad can swing away at Woodloch Springs, the kids can try mini golfing, go-karting, or rock climbing, and mom can slip into The Lodge at Woodloch for an award-winning luxury spa treatment. Woodloch Resort is continuously rewriting the all-inclusive resort rulebook, and luckily for your family, you’re all invited!